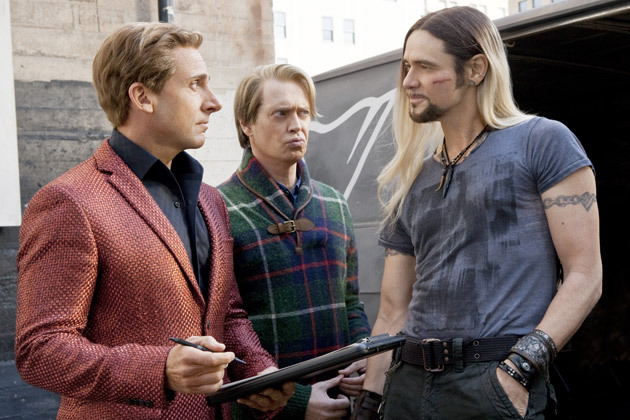 Steve Carell and Steve Buscemi step into more flamboyent roles than we are used to seeing them in as a pair of Siegfield and Roy-esque magicians in the comedy The Incredible Burt Wonderstone. Following an on-stage accident the two magicians break up and then must reunite to prove their relevance when a trendy new "street magician" (Jim Carrey) appears. The sci-fi flick Upside Down has the mind-blowing premise of trying to connect two lovers in a universe where two worlds face each other but each contains its own gravity. Kirsten Dunst and Jim Sturgess are the young wannabe couple in this visually stunning film. Halle Barry helms the thriller The Call, in which she plays a 911 operator who must help track down a young woman who has been kidnapped. Finally, our indie pick of the week is In the Family, a powerful drama by first-time filmmaker Patrick Wang about a the child of a gay couple in Tennessee whose life is turned upside down when one of his fathers dies in a car accident and the will names his sister as the boy's guardian. SERIES: New this week is Jack Taylor, about an ex-cop trying to earn a living as a private investigator in western Ireland. We've also got season 6 of Inspector Lewis, season 9 of New Tricks and season 2 of the Danish Borgen. SUBTITLED: Room 514 explores morality and cultural conflicts within the Israeli army as a female officer interrogates an older male officer accused of beating up an Arab family. DOCUMENTARY: Jeff Bridges narrates the documentary A Place at the Table about the large number of Americans who aren't sure where their next meal will come from. You can find all of our new and upcoming DVDs and Blu-rays in Bibliocommons. Swedish novels have been a huge success at the library ever since Girl With the Dragon Tattoo took the world by storm and foreign language films are always popular at the library. We are very lucky to now have a wide variety of foreign language tv shows to choose from. If you're getting tired of the same old boring American shows you should give one of these a try! Borgen, the second season of which comes out this week, has been widely acclaimed as one of the best series about politics ever made. It follows the first female prime minister who tries to run the country and stay true to her own personal beliefs. The popular set-in-Venice Donna Leon books have been adapted by German television into the successful Commissario Guido Brunetti Mysteries. Maigret follows the title detective as he investigates crimes in 1950's Paris and environs. 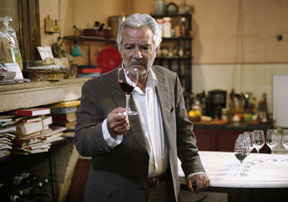 Blood of the Vine features a wine expert who becomes involved in solving crimes in French wine-growing regions. The Finnish Private Eye Vares is about a hard-drinking laid back private investigator who knows his way around a crime scene. The title character of Detective De Luca is a Bologna-based investigator in post-World War II Italy.